All Star Trek fans have seen them, the relentless, powerful and collective mind known as the Borg. They roam about the galaxy press-ganging everyone they can find into becoming ugly mind controlled drones who work for the good of the hive whether they want to or not. While we might hope for better from Star Trek we should not expect it. Trek has almost a pathological antipathy to anything Transhumanist, and explicitly rejects any kind of enhancement of Humans whether it is genetic (Eugenics Wars), medical (anti aging) or technological (Borg). Even brain computer interfacing seems off-limits. 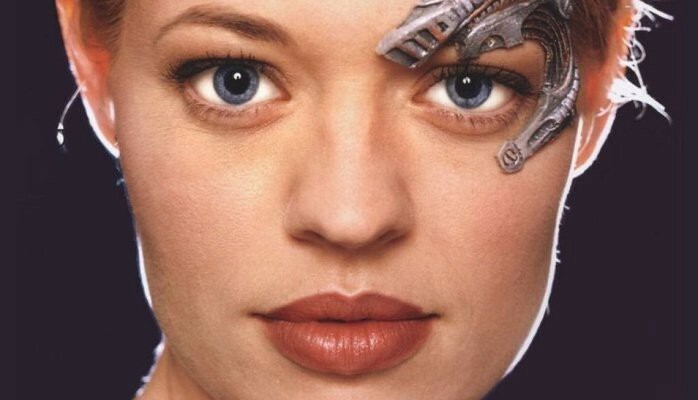 So, given that Trek is a Luddite propaganda tool why don’t we take a look at the “enemy”, the Borg, and examine things from their point of view? First off, why are the Borg depicted as ugly unhealthy creatures with bad skin who can barely stagger after their prey? Surely with such a technology we ought to expect extremely healthy versions of people who, because they are “optimized” for performance, would look more like Olympic athletes rather than extras from a zombie movie. Then we come to their ludicrous mechanical augmentations with assorted tubing hanging lose, one eye obscured and an entire arm removed and devoted to whirring tools. In other words, a Frankenstein parody of technology that was probably obsolete by the end of the 20th century. The kind of technology that would be blended into the biological would almost certainly be done seamlessly and would likely be unobtrusive. This is largely because the “machinery” would itself be nanotechnological as even the writers of Star Trek concede. The fact that they depict it as some kind of metallic plague that generates tentacled scabs we can put down to the implicit propaganda of “internal machines equals bad”. Of course, the evil core of the Borg trope is the notion of a hive mind enslaving everyone with whom it comes into contact. No doubt this is some American reaction to a caricature of Socialism, as the Borg clearly represents a Socialist society in many minds. Except the Borg is not a society but effectively a single creature that shares a single consciousness. The question of what happens to the consciousness of individuals who are assimilated is of course a source of much of the drama of the show. The strong implication is that it is overridden and somewhere deep inside is a powerless tortured soul being forced to witness the assorted atrocities it is being coerced into committing. But how realistic is it? To examine this we need to examine how individual minds could be merged into a group consciousness. In some ways this is simple since many models of our own mind suggest that the “self” is already a composite entity and self consciousness a kind of illusion created by the interaction of the parts that model the whole. Of course, the various aspects of the mind/brain communicate with each other using very high bandwidth channels compared to, say, voice input/output. Indeed, it may be equivalent to that used by our optical processing which is estimated to be in the low megabits per second. In other words, considerably less than your wifi internet connection. This indicates that if we want to model the Borg mentality we need to integrate some of the communication channels that are internal to individual brains, across multiple individuals. What parts of the brain would be involved is just speculation at present. However, we might have a clue when looking at projects such as that designed to create an artificial hippocampus. This is aimed at developing an electronic prosthesis to perform the function of the hippocampus, which is to lay down and retrieve memories. This device, if it could be made to work in Humans, would go a long way towards creating a “Borg interface” since memories are integral to a sense self. One can easily imagine people who have such a prosthesis linking them together in order to share memories. Easily imagined, but probably far from easy to do without massive external computing and knowledge of “brain language” we do not yet have. However, for the sake of argument let us assume it is possible. The result? Suddenly “I” can remember multiple lives. “I” have multiple streams of consciousness. “I” have an entirely new perspective due to all the knowledge that “I” now possess. “I” have a vastly expanded consciousness and “I” even have multiple bodies! Welcome to the Borg. There is no coercion. As soon as someone joins the collective their consciousness expands to encompass everyone. Their ego, for lack of a better word, becomes the ego of the collective. It is not a submerging of self into a twilight prison but a vastening into the light of a billion souls joined as one, along with their accumulated wisdom. It is also a granting of immortality, at least as long as a certain number of Borg minds are still online and connected. This would be the reality denied by the propaganda and as such would be immensely attractive to many people, not least the lonely, the persecuted, the loveless or indeed the outcasts of society trying to find a place in the world. No wonder Star Fleet does not want the truth broadcast!